If you need legal advice on any matter, give us a call. If we don't practice law in the particular area of your concern we can refer you in most cases to the right people who do. Consider our number a hotline for all your legal matters. The information provided on this web site is public information and should not be considered individualized legal advice. Therefore, the presentation of information on this web site does not establish any form of attorney-client relationship with our firm or with any of our attorneys. 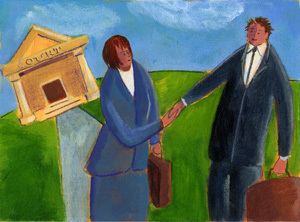 Should you require an attorney, please contact Hoffman Law Group at 301-838-9100. Although the information is updated and maintained as accurately as possible, it may contain errors or omissions, for which we disclaim any liability. Trust and confidence in your attorney are necessities in today's world where both personal and corporate legal concerns require resolution. At Hoffman Law Group, our goal is to work with our clients to obtain the best result we can in regard to their legal problems. We are committed to a problem solving approach that utilizes both creativity and flexibility. We view each client's concern as a matter that deserves special attention. In legal matters, the issues at stake affect real people and real lives. Whether it is protecting a business that has taken a lifetime to build, helping people obtain compensation as a result of someone else’s negligence, or assisting clients in family, divorce and real estate matters, these are important concerns that require understanding and focus. At Hoffman Law Group, you will find experienced and caring professionals who are there for you when you need them. Through our team approach, we emphasize the need to obtain good results for every client in a productive, timely and cost-effective manner. This takes the hard work, focus, cooperation and experience and good judgment of both lawyer and client. We are committed as your attorneys to bringing these abilities to every task.